Now before all EG members start doing this, I just wana point out that doing this is NOT cool. You still get money from ads while the stream is offline? wtf... Viewers tuning in the stream are provided with 0 content while they are, in a way, providing you ads revenue to support you. Why cant you just turn off the stream like a normal streamer? WTF.... Please sirscoot, evoli, fix this. Im sure it was a mistake. Why risk their report with earning .1 $ /h ? Bisu[about JD]=I was scared (laughs). The force emanating from his facial expression was so manly that I was even a little jealous. I completely agree,. this is blatant abuse. I don't want EG to be known as cheaters. Pls Fix. This is an obvious mistake. I don't watch Dota2 but I'm pretty sure this guy gets a good chunk of viewers. If he were to do this more often people would stop watching so this would hurt him way more than the peanuts he actually earns this way. There is absolutely no need for additional moderation on this, if users want to view this they will otherwise they will not come back because of this. Do you feel the same way about reruns or random vods playing? Stop trying to "regulate" the freedom of stream it's scary. Lol why so many complainers, the screenshots even says ''Click the follow button to see when I come back online''. Its obviously a mistake, no need for thread. You know there is streamers that leave their streams on all day often just looking at nothing but their chair? I do. Cmon seriously this is such a stupid complaint. I agree with this. if you dont like it, you are free to check out other streams. noones forcing you to watch that screen. dont get so emotional about everything. Now before all EG members start doing this, I just wana point out that doing this is NOT cool. You still get money from ads while the stream is offline? wtf... Viewers tuning in the stream are provided with 0 content while they are, i away, providing you ads revenue to support you. LOL EG raising their standarts a notch. I guess they're collecting money to poach yet another player. This is unacceptable, his stream will be removed if this continues. Why are people calling this a mistake? This is a blatant advertising attempt to reach out for followers. I have a hard time understanding why it is unacceptable. Does it violate the TL rules for streaming? or getting your stream featured? dont get me wrong im not saying everyone should do it. but, its like watching tv. if you dont like what you're seeing. change the channel. maybe im missing something here. I can't put my mind around how anyone can possibly think this is okay. If this was okay, all you would have to do to gain free money would be to set up the stream, leave it runnning 'pretending it's live' showing up ads and have people join it 'pretending they're watching' and then share the money. That is not okay, not even close. I can't put my mind around how anyone can possibly think this is okay? If this was okay, all you would have to do to gain free money would be to set up the stream, leave it runnning 'pretending it's live' showing up ads and have people join it 'pretending they're watching' and then share the money. He is exploiting the stream list by leaving an obviously offline stream online so that people click it and he gets ad revenue. Not only that, he is exploiting TwitchTV by constantly running ads on a content-less stream so anyone who left the stream open is being flooded with ads. Terrible all around. Prove it isn't an honest mistake. All it takes is forgetting to click a single button and the stream stays online when you didn't mean for it to. Several prominent league of legends streamers do this too. I know that hotshotgg is known for an ad script that he keeps on while he is afk that is shown to about 2k + viewers. Abuse like this should not be happening since there is a limited amount of resources that these companies have to spend. 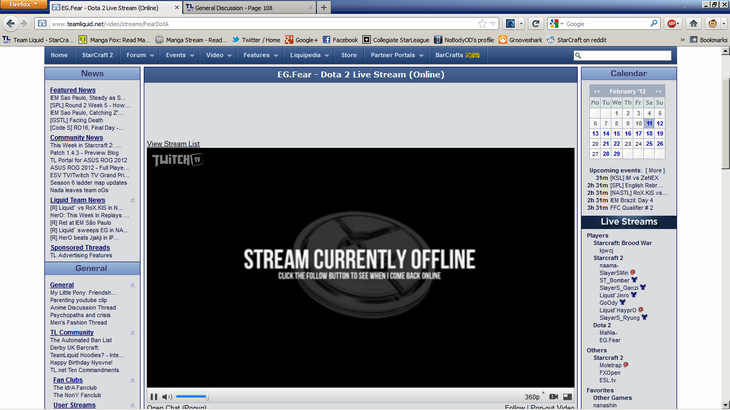 well for starters there's an EG overlay that says it's offline when it's clearly not? If you make money from ads one would expect for the ads to be seen. If you're streaming 'no content' someone might join but nobody is watching the stream. From whatever point I look at it, it's taking money for nothing - stealing. There is no scene that says "this stream is offline click here to follow" unless he purposefully creates it. Also I'm pretty sure a stream left alone by itself doesn't constantly try to run ads. This is pretty obviously a horrible attempt at exploiting viewers and TwitchTV for ad revenue.